Rich, successful and married -- with a beautiful mistress on the side -- top Glasgow lawyer Michael Gibson is to all appearances an enviable man. On the inside, his life is falling apart. Philippa, his lover, is demanding a divorce, but his wife refuses to cooperate. Meanwhile, an event from his shady past threatens to resurface and wipe out everything he's achieved. Worst of all, the city's most notorious psychopath, Jack McFarlane -- a man whom Gibson has good reason to fear -- is about to be released from prison. When Gibson's wife goes missing, DCI Charlie Anderson has to establish if he's dealing with a case of abduction, suicide or murder. As events unfold against the uneasy streets of modern Glasgow, Anderson finds his renowned analytical skills seriously challenged. DCI Charlie Anderson has to look into these events as well as other cases that his team are handling in this thoroughly engrossing and very well written police procedural. As is usual there are lots of different clues to be checked and eliminated and a finite time to it and as always there are senior policemen threatening to bring in fresh people if the team cannot complete the leads and get a result. Anderson, however is not put off by all the pressure as he has an understanding wife and family and his police team are very well chosen and supportive. 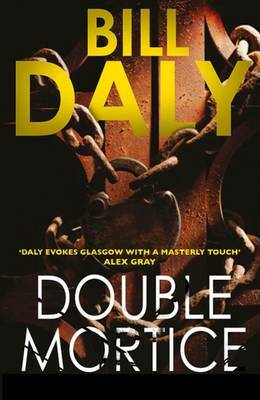 DOUBLE MORTICE is a brilliantly gripping and well plotted story by an extremely talented author who handles his subject matter with great dexterity and humour. This is one of the best police procedurals by a British author that I have read in a considerable time. I found the story very exciting and fast moving with enough twists and turns to keep you gripped as the pages just flew by. The author has great story telling abilities and all of his characters are very well drawn with a rich credibility to them which is often absent from other similar books. I had the pleasure of reading for review purposes his previous and debut DCI Charlie Anderson novel BLACK MAIL and enjoyed it tremendously and was therefore very pleased to read this his second book in the series. The locality of Glasgow is well evoked with plenty of references to the Scottish diet and humour as well as street names and other geographic descriptions which should appeal to Scottish readers, but which may have been a bit beyond me without the help of Google maps. I truly loved reading this book and enjoyed it tremendously and didn't want it to end and will definitely look out for further books by this greatly talented British author who now lives and works in Montpelier, France. Extremely well recommended.